Honda ATV - Your Complete Guide. 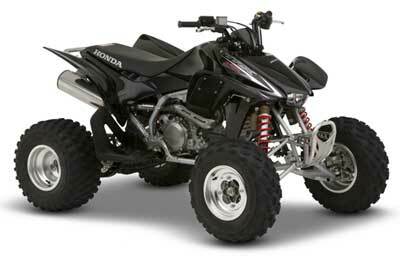 Info about Honda Utility and Sport ATVs - Parts - Accessories and More. Our Honda ATV Guide will cover the most requested info about the guys that started it all. From the latest models to favorites from the past. There's a lot you want to know about the ATVs from Honda, and we'll do our best to give it to you. That means we'll be constantly updating this section, so check back often. If there's something else you would like to see - let us know. 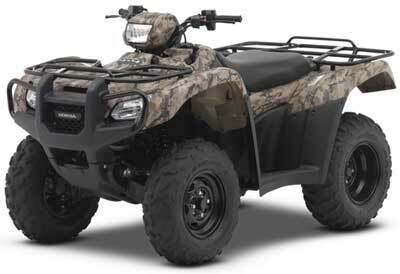 Honda 4 Wheelers 4x4 Models - Don't miss our buyer's guide to Honda ATV 4x4 models like the Rancher, Foreman, and Rincon. How and where to find these four wheel drive models at the best prices. Honda's smallest utility ATV is tough and reliable. The Recon has a well deserved reputation for reliability and low maintenance requirements. It offers a good combination of utility style with the simple practicality of an air cooled engine, shaft drive, and 2 wheel drive. The Recon is a good choice for beginners, smaller riders, and those just looking for a basic ATV. Honda Recon ATV Guide - Learn all about the current Recon models in greater detail. Included are riding impressions and why this ATV is a top entry level choice. The Rancher 420 line includes models with manual transmission and 2wd to 4x4 models with an automatic dual clutch transmission and independent rear suspension. 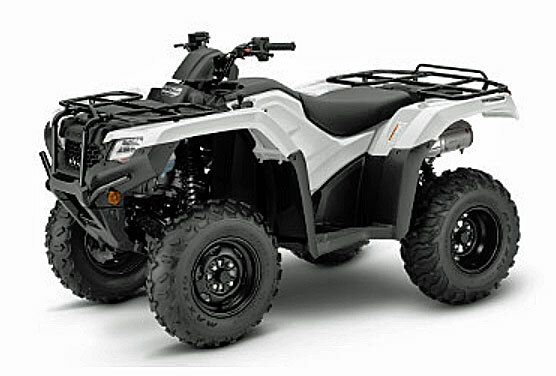 The Honda ATV Rancher line includes models with 2wd, 4wd, electric shifting, power steering, solid rear axles, independent rear suspension, and automatic transmissions. We can't imagine that anyone in the market for a mid-size utility ATV couldn't find a Rancher to fit their needs. 2019 Honda Rancher 420 Guide - Covers the six Rancher 420 models offered for 2019 with prices, photos, specs, and key features. Honda Rancher ATV Guide - Confused about all the Rancher models? Use our handy guide to sort through all the differences. Details all the equipment available for each Rancher model. Honda Rancher AT - Don't miss out review and test of the newest top of the line Rancher AT. Now with independent rear suspension and the most advanced ATV transmission currently available. If you think Honda has fallen behind on advanced technology, this one may change your mind! 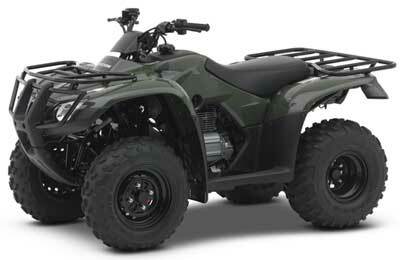 The working man's ATV features revised engine and suspension for more power and better handling. Optional power steering and electric shifting add to the fun. The Foreman has long been known for its' hard working nature. But the recent improvements with fuel injection, better suspension, optional power steering and electric shifting, have put a little more sport in this utility ATV. But don't worry, it hasn't lost the ability to do the hard work that made it an owner's favorite. Honda Foreman Review - Catch up on all the changes to the new Foreman. Our review covers the working class Foreman and some options that will make that work even easier. The only Honda utility ATV with a CVT transmission. But it still doesn't have a belt. Honda Rubicon Review - Full review of the veteran Rubicon. This is the hard working utility ATV with the industrial strength transmission. When the chores get serious, this Honda ATV is ready to go. Honda calls the Rincon the SUV of ATVs. Honda Rincon Review - Honda's most expensive top of the utility ATV line. The big engine and independent rear suspension can handle sport riding as well as the chores. The only utility ATV with and automotive style transmission. Honda youth ATV for riders over age 12. 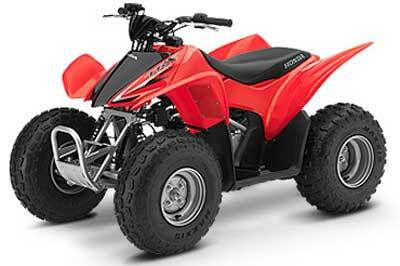 Honda's youth ATV has sporty styling balanced with plenty of practical features. Electric starting gets things going with a mi nu mum of hassle. An automatic clutch and manual shift 4 speed transmission make riding easier for the beginner. Easy maintenance and proven reliability make things easier for the parents. Sport styled ATV with utility style toughness. This entry level Honda ATV is a unique combination of sport and utility ATV. Styling is all sport, but many of the mechanical components come from the Recon utility ATV. You get the suspension, brakes, and driveline from the Recon, including the longitudinal engine mounting and shaft drive. A manual clutch for the 5 speed transmission adds to the sport riding experience, but it has a no-stall feature to make it easier for new riders to master. Electric start and a revers gear keep things user friendly. The TRX 400 is one of the most refined and reliable all around sport ATVs you can buy. The 400 has a reputation for anvil like reliability. Which is amazing considering it's intended use as a pure sport ATV. There's no tricks, but every component has been refined and developed over the years. Everything you need in an all around sport ATV is here. Solid air cooled engine, 5 speed with reverse, triple disc brakes, long travel suspension, and standard skid plates. It's the closest thing to a no hassles sport ATV there is. It won't win many races, but that's not what it's for. It will provide years of reliable and fun sport ATV riding as well as any machine we know about. With wins in everything from MX to Baja, the 450R is the racer's ATV. 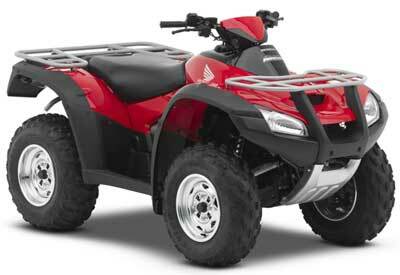 The 450R is the serious racer of the Honda ATV Sport line. It may not currently be the fastest in the class, although it has an awful lot of wins on its' resume. Based on feedback from owners, we can say it is the most reliable ATV in the class. If you want more track time than down time, the well developed 450R is a good choice for aspiring racers. There's plenty of go-fast stuff with a stout liquid cooled engine, double adjustable shocks with long travel suspension, and triple disc brakes. 2009 was the last year the 700 was built. The TRX 700 was only made for a couple of years and just didn't sell well. There are still a few unsold ones around, so you might find a dealer willing to discount one to move it. The spec sheet looked impressive with a big liquid cooled and fuel injected engine, 4 wheel independent suspension, and disc brakes. It was just a combination that didn't appeal to very many buyers. 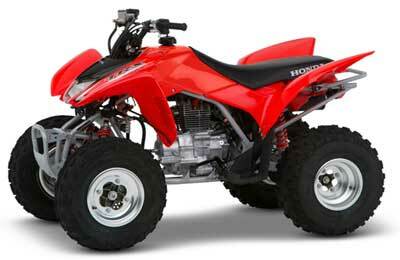 Honda 4 Wheeler Parts - When should you buy new parts and when are used parts the better choice? We give you our thoughts on when to do what. And of course where to find the best deals. ATV Batteries for Honda - When it's time to replace your ATV battery there are a few things you'll need to know. Find out what they are and where to get the best deals on ATV batteries. Honda Four Wheeler Parts - If you're looking for a great deal on Honda four wheeler parts we may have some help for you. In this economy we like to save money any way we can. We'll tell you how we do it. ATV Tires for Hondas - How to find the best deals on Honda four wheeler tires. We looked high and low for the best deals on tires for Honda 4 wheelers and we'll tell you everything we found out! From which kind of tires you need to the best places to find them. It's all here. 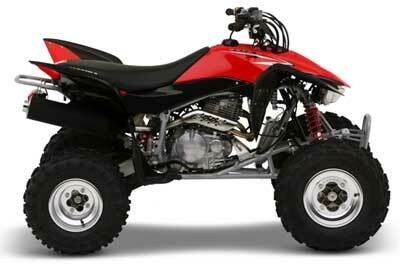 Honda ATV OEM Parts - Tips on finding Honda OEM ATV parts at value prices. Tired of paying dealer retail for parts? Don't miss this article. Honda Service Manuals for ATVs - If you're ready to tackle that next repair job yourself, you'll need a service manual. We tell you what to look for and where to get the best deals. 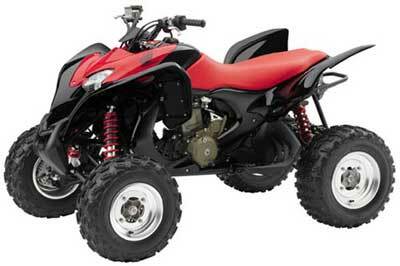 Used Honda ATV Parts - We tell you where to find the best deals on used ATV parts for your Honda. Tips for buying used parts online with links to recommended sources. Honda Four Wheelers For Sale - Step by step guide to finding the best buys from online auctions. Lots of tips to help you get the best deal on your Honda 4 wheeler. Honda Used ATVs for Sale - Best buys in all categories are revealed. Complete with customized links to actual used Hondas for sale today!